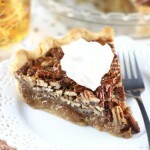 An unconventional pecan pie that starts with a brown butter and bourbon base! Add the dark corn syrup and sugar, cooking for an additional 1-2 minutes, or until the sugar is dissolved. Remove from heat and cool for 10-15 minutes, or until the mixture is close to room temperature. Whisk in the eggs, bourbon, and vanilla. Bake at 350 degrees for 40-45 minutes, or until the center of the pie puffs, and the filling is set. Transfer to a wire rack to cool completely. It helps to chill the pie in the refrigerator for 1-2 hours before cutting. Even if you serve the pie at room temperature, an hour or so in the fridge helps it to firm up. Combine heavy cream and powdered sugar in a large mixing bowl. Beat until the mixture just reaches stiff peaks, about 5-6 minutes. Beat in the bourbon. Serve with the pie!